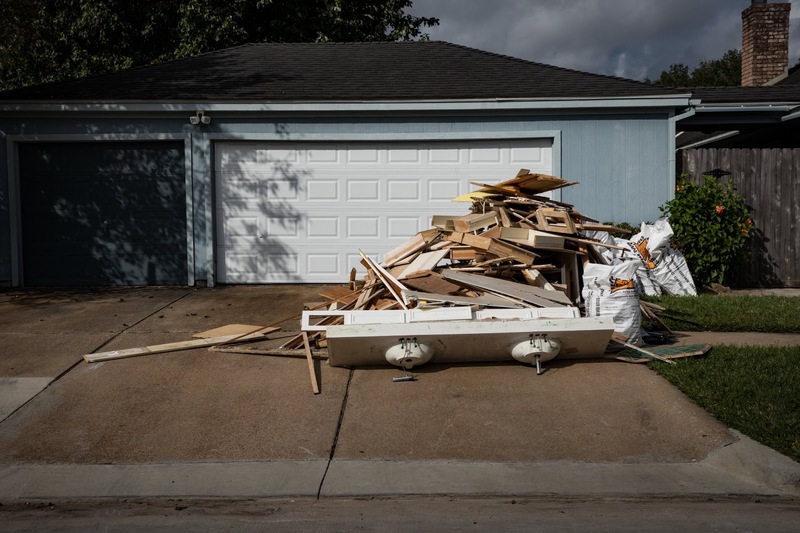 BERKELEY – It has been one year since Donald Trump was elected president of the United States, and America’s democratic institutions are clearly under strain. A mere 20% of Americans now trust the federal government to “do the right thing,” while trust in Congress has fallen below 9%. Among congressional Republicans, in particular, a “take-no-prisoners” extremism is undermining the federal government’s capacity for action, which is precisely what many on the far right want. According to some pessimists, the US Constitution was not designed to address the challenges of a country so sharply divided by income, race, and partisanship. Yet state and local governments are still trusted by most voters, and they have the power under the Tenth Amendment of the US Constitution to strengthen democratic institutions. Already, many states and cities are adopting reforms to encourage political compromise and improve democratic governance. Better yet, some of these reforms have national implications, because they will clean up the process by which members of Congress are elected. State and local reform movements are focused on four structural threats to democracy: gerrymandering; poorly designed primary processes; money in politics; and legislative procedures that impede compromise. Gerrymandering, whereby state legislators redraw congressional districts to favor their own party, allows politicians to choose voters, rather than the other way around. While the practice dates back to at least 1812, when then-Massachusetts Governor Elbridge Gerry oversaw the redrawing of his state’s senatorial districts, it has been perfected in recent decades, mainly by Republican-dominated state legislatures. Republican-drawn districts in Texas and the six swing states of Ohio, Florida, Michigan, North Carolina, Pennsylvania, and Virginia had a clear influence in elections to the US House of Representatives in 2016. Now, almost all of these states’ electoral maps are being challenged as unconstitutional. And in Gill v. Whitford, a landmark case from Wisconsin, the US Supreme Court will soon issue its first ruling in a decade on the constitutionality of gerrymandering. Elsewhere, state governments have taken the more radical step of establishing special redistricting commissions that are independent of the two dominant political parties. And in 24 states, voters can propose ballot initiatives to change districting rules and limit the impact of gerrymandering. Voters in California and Arizona have already done so, and similar measures will likely be on the ballot in other states in 2018 or 2020. By opening up party primaries to more candidates, or by using ranked-choice voting (RCV) – which allows voters to list as many candidates as they want, in order of preference – we can ensure that elected officials represent the full spectrum of voters. RCV has already been adopted by a number of American cities and the state of Maine, and one hopes it will continue to spread in the years ahead. A third necessary reform concerns money in politics. Ideally, we should have strict limits and transparency requirements for all political donations. But the Supreme Court made achieving that much harder with its controversial Citizens United decision in 2010, when it held that campaign donations – even from corporations – are a protected form of free speech. The court’s ruling not only invalidated existing campaign-finance law; it also overturned several prior Supreme Court decisions. Not surprisingly, hidden spending by big donors has skyrocketed in the past seven years. Ballooning undisclosed political spending and social-media advertising – by both domestic and foreign entities – has made increased transparency an urgent necessity. With details continuing to emerge about how Russia used social media to influence the outcome of the 2016 election, a growing chorus is calling for stronger legislation to regulate online activities. Currently, platforms such as Facebook and Twitter are not subject to the Federal Election Commission’s transparency rules. The regulation of political spending is substantially different at the state level. All 50 states require disclosure for contributions to campaigns for state offices, 39 states have a cap for individual contributions, and 22 states prohibit corporations from contributing to political campaigns altogether. Furthermore, many states are exploring the possibility of making disclosure rules permanent through constitutional amendments. And 13 states already offer a public-financing option for candidates running for state office, with many more poised to follow suit in response to grassroots pressure. A final structural threat to American democracy is the partisan manipulation of legislative procedures. When the majority party in either house of Congress routinely changes the rules to suit its own ends, crafting bipartisan solutions becomes almost impossible. Similarly, at the state level, legislative supermajorities, arbitrary thresholds for passing budget and tax measures, and ballot initiatives financed by special interests can all impede bipartisan problem solving. But as California has shown, structural barriers to good governance can be eliminated through citizen-driven reforms. In recent years, the California legislature has cleaned up redistricting, introduced “top two primaries” and an aggressive disclosure system, reformed term limits, eliminated a supermajority rule for state budgetary measures, and improved the ballot-initiative process. As a result, the legislature has become dramatically more effective, and its approval rating has gone from just 14% seven years ago to 57% today – its highest level since 1988. There is little reason to believe that Congress will reform itself. But if the movement for progressive federalism continues to gain momentum and push through meaningful state- and local-level reforms, federal lawmakers will not be able to maintain the status quo indefinitely. With a renewed confidence in democracy, citizens can take action to ensure that elected officials are governed by the right incentives, and motivated to pursue bipartisan solutions to the country’s problems. If California can do it, so can other states. America’s founders created the Tenth Amendment precisely because they worried about dysfunction in the capital. It’s time we used it. Lenny Mendonca, Senior Fellow at the Presidio Institute, is Senior Partner Emeritus at McKinsey & Company. Water drains naturally in this stretch of Texas, or at least it used to. 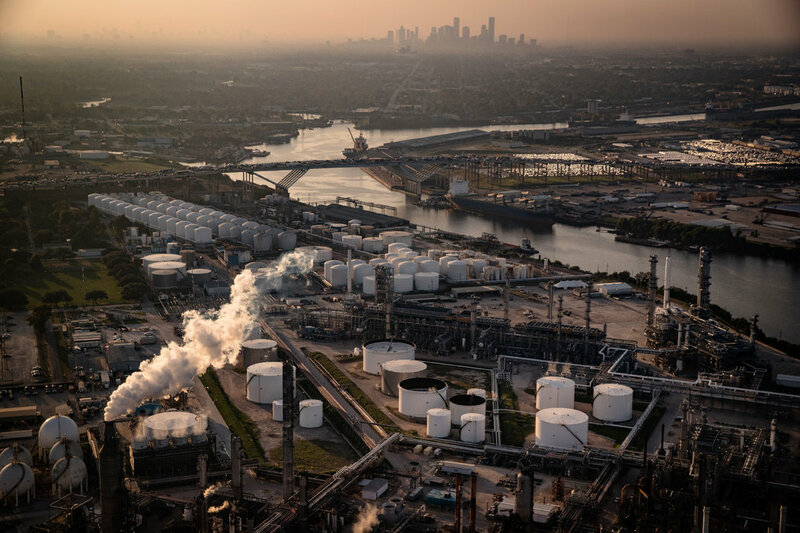 At more than 600 square miles, Houston has grown to be as big as Chicago, Cleveland, Detroit and Philadelphia combined, a giant spread of asphalt smothering many of the floodplains that once shuttled water from the prairies to the sea. When finished, the newest road to ring the city and propel its latest expansion, called the Grand Parkway, will encircle an area equivalent to all of Rhode Island. 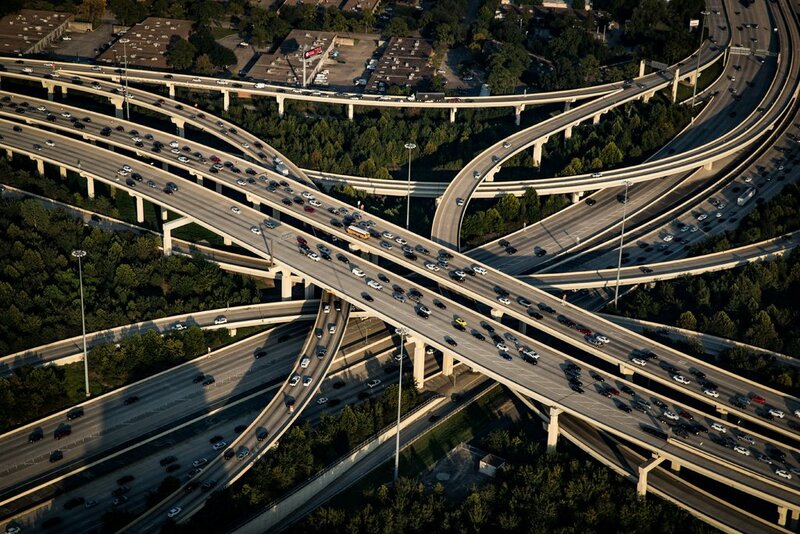 Built on a mosquito-infested Texas swamp, Houston similarly willed itself into a great city. It is the country’s energy capital, home to oil and carbon-producing giants, to the space industry, medical research and engineers of every stripe. Its sprawl of highways and single-family homes are a postwar version of the American dream. The spread of asphalt and concrete has inhibited rainwater from draining naturally in Houston. 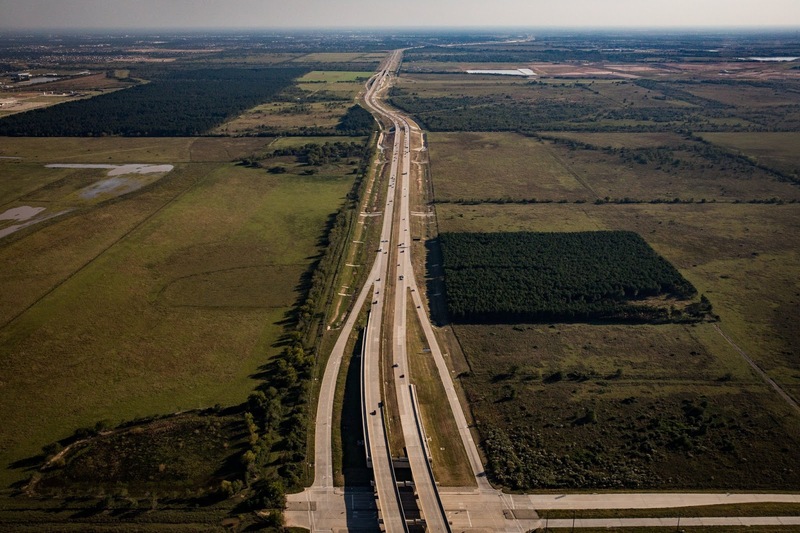 When finished, the Grand Parkway, above, on the edge of Houston, will encircle an area equivalent to all of Rhode Island. “These days that means they’ll flood anytime you look at them funny,” Mr. Blackburn said. 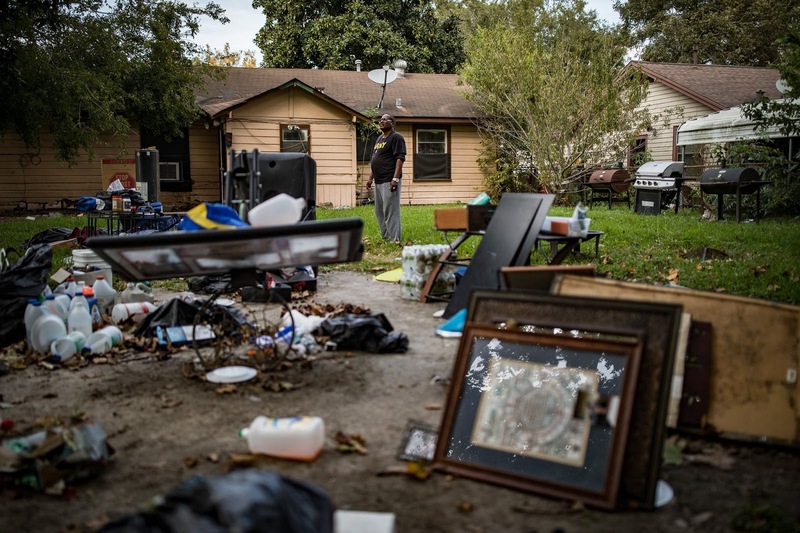 Bruce Hooper, outside his home in Kashmere Gardens in Houston, would like to move but has no place to go. 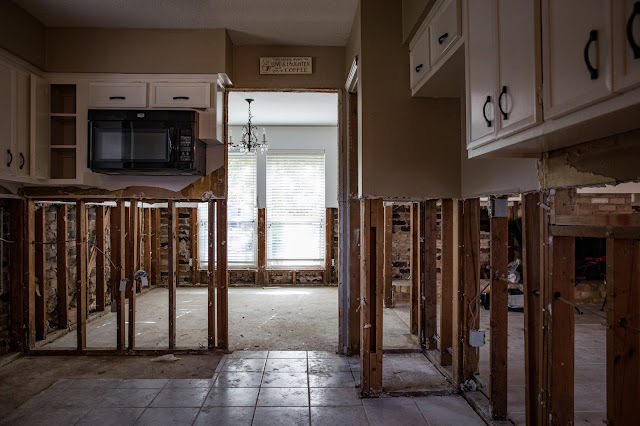 Residents in some neighborhoods, like Bear Creek Village, had no inkling they lived in harm’s way before Hurricane Harvey. 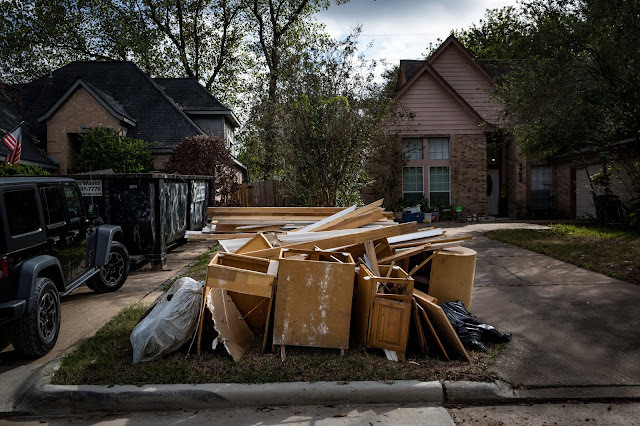 Many neighborhoods in Houston are still piled with debris from the storm. After criticism from Houston’s mayor, Gov. Greg Abbott of Texas provided $50 million to help with cleanup. 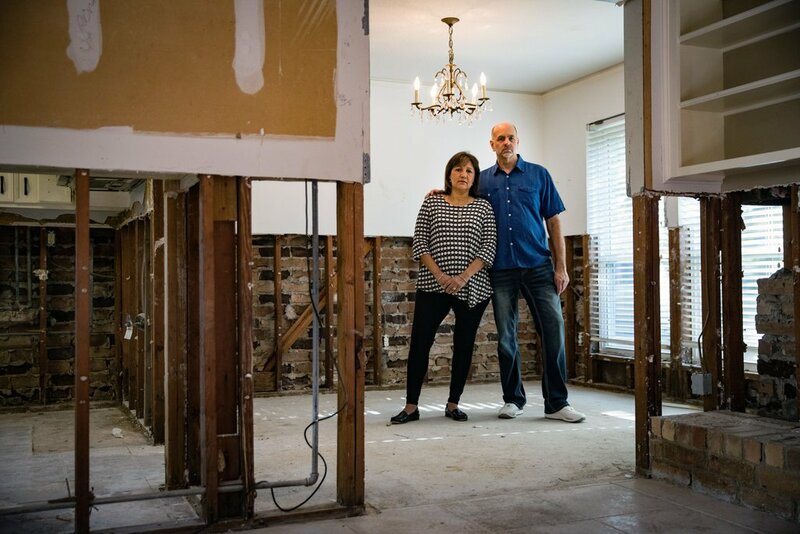 Andy and Christine Kahan inside their damaged home in Bear Creek Village. 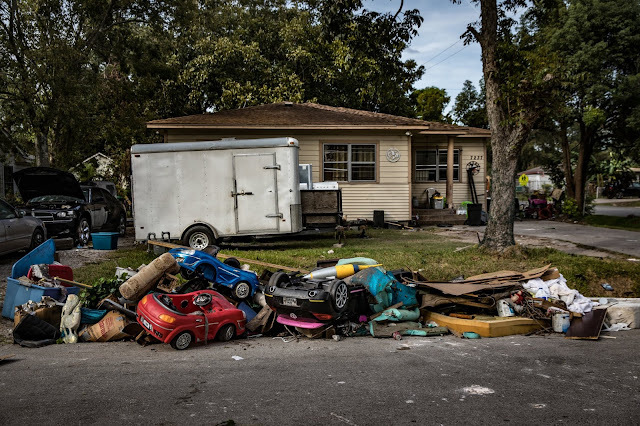 “Welcome to the war zone,” Mr. Kahan said. 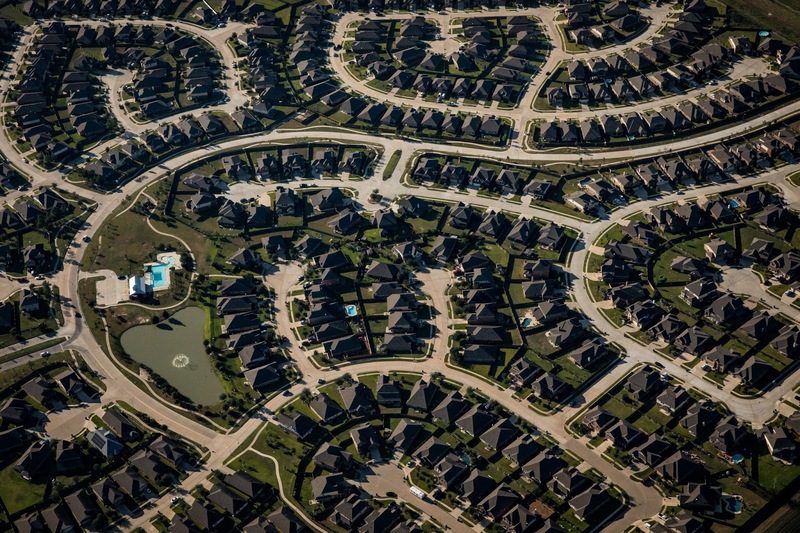 Urban sprawl is only part of the story of Houston. The city was also built on an upbeat, pro-business strategy of low taxes and little government. MARKETS and manias go together. The latest frenzy is for all things crypto. The price of the best-known digital currency, bitcoin, has risen by nearly 700% this year and is now about $7,500; one enterprising firm recently quadrupled its share price simply by adding the word “blockchain” to its name. But nowhere do alarm bells ring more loudly than in the realm of “initial coin offerings” (ICOs), a form of crowdfunding in which firms issue digital “coins” or “tokens” in return for a payment (typically in ether, another crypto-currency). 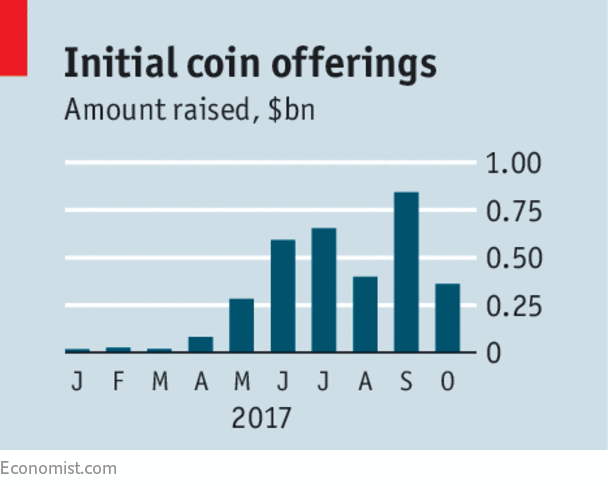 ICOs have raked in more than $3.2bn this year, rivalling the money flowing to internet startups from early-stage venture capital. Although most of these tokens are supposed to be used in exchange for the companies’ products, as in a corporate loyalty scheme in the offline world, investors scent something different: the chance to be in at the birth of another bitcoin. It is tempting to dismiss ICOs as nothing but a fraud’s charter. They are easy to pull off, requiring little more than a few enterprising souls and an ambitious-sounding plan. Unlike equity-owners, coinholders get no claim on an issuer’s earnings. Projects are being marketed to retail investors. In September America’s Securities and Exchange Commission (SEC) brought its first charges against a token-issuer, for allegedly promising hefty returns from firms that barely exist. China and South Korea have banned ICOs altogether. Yet there is usually meaning in the madness of technology-driven bubbles. The British railway mania in the 1840s helped create a national network of train lines; the dotcom boom spawned firms such as Amazon and eBay. So it is with ICOs. They can provide a source of finance for serious software projects which otherwise have a hard time getting off the ground. As an analogy, imagine that in the early days of the internet domain names had been sold to finance the development of the network with the promise that their value would rise as online traffic grew. ICOs may also give rise to new forms of firm: because founders, employees and users hold coins, everyone has an interest in seeing their network grow, as this will drive up the value of the token. One example of this is Filecoin, which in September raised $257m and will allow token-holders to buy and sell digital storage on each other’s computers. Enthusiasts say that these “crypto co-operatives” combine the advantages of a firm—lower transaction costs, aggregation of capital—with a decentralised structure that means no one controls it or the data it holds. Such hopes may prove unfounded, but there is a chance that organisations of this sort could offer an alternative to the monolithic tech giants of today. For these reasons, it is wrong for regulators to ban ICOs. Fortunately, most are more thoughtful. Some, like the financial-market authorities in Quebec, have invited ICOs into a regulatory “sandbox”, where less strict rules apply. The SEC has issued a useful report giving guidance about when a token is a security, meaning that an ICO has to comply with registration requirements. This month it warned celebrities against making endorsements of an ICO (as Floyd Mayweather, a boxer, and Paris Hilton, a socialite, have done). The big test of regulators will come when the ICO bubble pops, as it surely will, and people lose money. If the backlash is severe, ICOs and the organisations they finance might fall out of favour for years to come. A lot of today’s ICOs sound silly, and some are scams; most of the projects they finance will fail. But they might just contain the seed of a digital future that is not dominated by a few online giants. The motivations that underlie a country’s decision to borrow money are not always strictly economic. Take Turkey, whose ratio of gross external debt (all public and private sector debt) to GDP has increased from 39% in 2012 to 52% today. Turkish President Recep Tayyip Erdogan has been pushing to increase investment by increasing available credit to spur economic activity. This is a political goal, though one motivated by economic objectives. The problem Erdogan encountered, however, is that there was not enough domestic capital available to meet Turkey’s lending needs. When a country chooses to borrow, it has two sets of choices. First, should it borrow domestically or from abroad? Second, should its debt be denominated in domestic or foreign currency? Each option has its own implications, but it is particularly constraining when a country borrows from abroad in a foreign currency. When debt is borrowed in another country’s currency, the borrowing country no longer has the option to depreciate its own currency through monetary policy in order to decrease the relative value of its debt. The other risk involved in foreign currency borrowing—beyond the risk already inherent in borrowing—is that the borrower’s currency will decline in value and increase the cost of debt service. For example, if a country borrowed $100 million at 10% in US dollar-denominated debt, it would owe $10 million per year. If the exchange rate between the borrower’s currency and the dollar is 2 to 1, then that $10 million is equal to $20 million of its own currency per year. If its currency depreciated and the exchange rate to the dollar became 4 to 1, it would still owe $10 million, but in terms of its own currency, that figure would have doubled to $40 million in debt service per year. The pitfalls are clear, but for Turkey, domestic borrowing is not a sufficient option. Banks lend money that is entrusted to them in the form of deposits. The quantity of deposits is determined by a society’s proclivity to save. If deposits are lacking, then the bank will have only so much domestic capital to lend. Herein lies Turkey’s dilemma: The government wants to boost economic growth by extending greater credit to encourage investment, but there isn’t enough domestic capital in the banks to meet these goals. Turkey’s savings rate, at about 15% of GDP, is lower than that of other economies categorized by the International Monetary Fund as being at a similar stage of development. Turkey’s solution to this capital shortfall has been external borrowing, albeit with some restrictions. Households are not allowed to take out consumer debt that is denominated in foreign currency. Instead, it is primarily financial institutions that borrow in foreign currency—mainly US dollars and euros—and once the capital flows into Turkey, banks extend credit domestically in Turkish lira. With this maneuver, Turkey is essentially accepting greater long-term financial risk for short-term economic growth. More credit is available for projects now, but with every dollar or euro that is borrowed, Turkey faces an incrementally greater challenge to service its debt should the lira’s value fall relative to the dollar or euro. But Erdogan, who overcame a coup attempt just last year, cannot afford the risk to his presidency that a flailing economy would create. Though he consolidated his position last year after the coup with major political purges, and this year with a referendum that expanded his presidential powers, maintaining positive economic momentum is critical to ensuring the continued support of his base. There are other ways that Erdogan could increase the availability of capital for lending within Turkey, but they come with their own constraints. Raising interest rates would increase savings and attract more lira deposits. Turkey has done this to some extent, but it can push rates only so high. For while higher interest rates encourage people to deposit money in interest-earning accounts, they also increase the cost of borrowing money domestically. When deposit rates go up, borrowing rates must also go up so that the bank can maintain a spread and, therefore, profitability. The need to both maintain a strong lira and keep credit freely available has opened somewhat of a rift between Erdogan and Turkey’s central bank. The bank sees the abundance of credit and growing inflation as a threat to the lira’s strength—and thus Turkey’s ability to service its foreign debt—and so it wants to increase interest rates. But higher rates mean less credit, and Erdogan needs to keep the debt tap open to prevent an erosion of his control over the country. Turkey’s problems aren’t just its own. Turkey has the 17th-largest economy in the world. 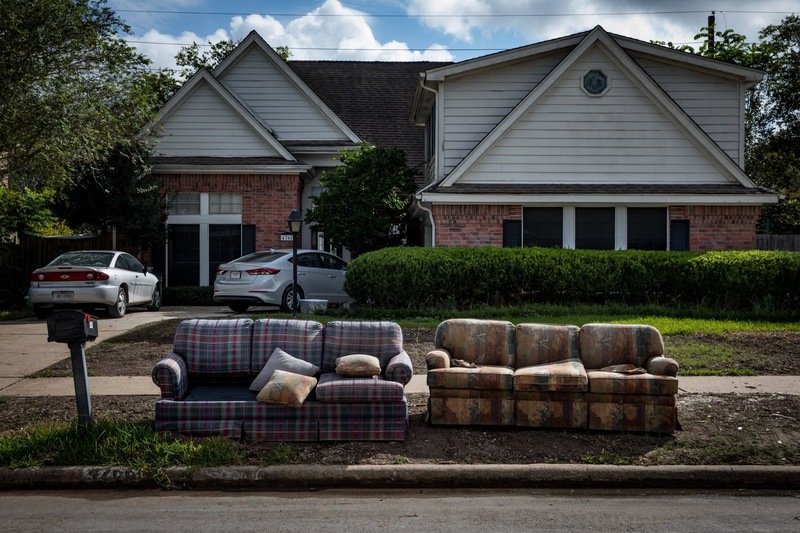 If it were to falter, the implications for its lenders would be severe. But its finances also affect regional security. If Turkey is financially stable and politically united, it can turn its gaze outward and try to exert greater control over its near abroad. But if Turkey’s financial system is compromised in a run on foreign exchange reserves, then its economy will be threatened, and with it, Turkey’s ability to maintain its ever-growing military deployment in Syria. Without a Turkish presence in western Syria, then Iran, which has been Turkey’s rival since the days of the Ottoman Empire, would have a freer hand to influence areas farther west in Syria—areas that Turkey would prefer it to stay out of. Turkey’s approach entails greater, but not unmanageable, risk. Should it fail, such as in the event of a rapid fall in the value of the lira, Turkey’s financial system—and thus its immediate ability to project power—would be weakened.